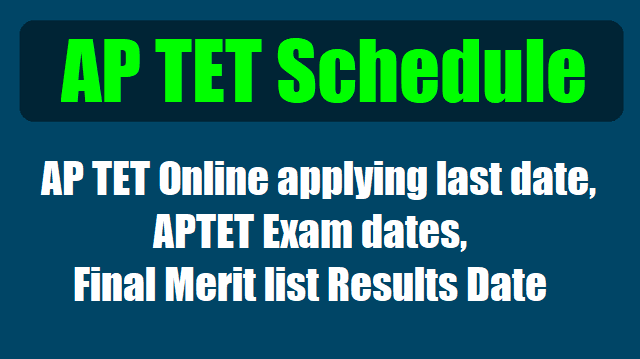 AP TET 2019 Schedule, #APTET Online applying last date, APTET Exam date, AP TET Results Date are announced: The Commissionerate of School Education (CSE), Andhra Pradesh has released the schedule for Andhra Pradesh Teacher Eligibility Test (AP TET). The AP TET exams are being conducted in the state for the first time. TET is a basic eligibility test upon qualification in which candidates could be appointed as government teachers. The application process for APTET 2019 will begin shortly as per the tentative schedule. The exams would be conducted in June 2019. As per the tentative Schedule, the online application process will commence from May 09, 2019 and end on June 24, 2019. The candidates applying for the exam would need to pay the application fee first. The payment of fee through payment gateway will be facilitated from May 09, 2019 to May 23, 2019. AP TET 2019 Exam Dates Changed: The examination will now begin on June .., 2019 and will continue till .. June 2019 and will be held in two sessions (9.30 am to 12 noon and 2.30 pm to 5.30 pm). Exam dates have been changed for Andhra Pradesh Teacher Eligibility Test (APTET) 2019. Online registration date has also been extended to .. May 2019. The revised exam schedule is available on the official website cse.ap.gov.in. According to the old schedule, the exam dates were .. June 2019. The APTET-, 2019 is being conducted by Department of School Education, Government of Andhra Pradesh in all 13 Districts of the State through a Computer Based Test. The objective of APTET is to ensure National Standards and benchmark of Teacher quality in the recruitment process in accordance with the National Council for Teacher Education (NCTE). Online mock test will be available from .. June 2019. APTET 2019 Notification: Check Syllabus, Important Dates, Eligibility Details from the given below links here. The examination will now begin on .. June 2019 and will continue till .. June 2019 and will be held in two sessions (9.30 am to 12 noon and 2.30 pm to 5.30 pm). Likewise, the Board will also delay the result declaration by more than a fortnight (26 February 2019). The candidates at the time of applying for APTET, 2019 should be in possession of the minimum qualifications prescribed for a teacher for I to V classes (Paper-I) and VI to VIII classes (Paper-II) as given in Information Bulletin. The candidates who are pursuing final year of any of the Teacher Education Courses recognized by the NCTE or the RCI, as the case may be, during the academic year 2018-2019 can also appear for the APTET , 2019. However, the notification said, it is clarified that appearance or a pass in APTET by itself will not vest any right on the candidate to be considered for appointment to the post of Teacher in Government / ZillaParishad / Mandal Parishad / Municipal and Private Aided Schools, unless he is in possession of the qualifications prescribed for appointment to such post in the relevant statutory recruitment rules framed by State Government from time to time or by the said management as on the date prescribed there in. AP TET Paper I :: In case of AP TET Paper I which will be conducted for classes 1 to 5, the minimum qualification is Intermediate with a pass in 2 - year Diploma in Elementary Education / 4-year Bachelor of Elementary Education (B.El.Ed.) / 2 - year Diploma in Education (Special Education). :: In case of AP TET Paper II which will be conducted for classes 6 to 8, the minimum qualification is a graduation degree in any discipline with a Bachelor of Education degree. Candidates are advised to go through the official notification for detailed information on eligibility criteria. Both the papers will have 150 multiple choice questions (MCQs) and will be of two and half hour duration. Andhra Pradesh Teacher Eligibility Test, APTET 2019 revised schedule is now released and available on the official website. As per the official notification released, the online applications have been extended. Interested candidates can now apply on aptet.apcfss.in till May .., 2019. The examinations had already been pushed farther and scheduled now to start from June .. and end by June .., 2019. Please note, as per the revised schedule, the last date to pay the fee is May .., 2019. Also, in case you wish to apply for APTET, you are required to first pay the fee online and then fill the online application form. Candidates who have already paid the fee but could not fill the application form can do so now. The portal would be accepting complaints regarding the online application process till May .., 2019. Also, the APTET 2019 Mock Test would be released on the official website on June .., 2019. The facility to download APTET Admit Cards for APTET 2019 would start from June .., 2019. The schedule for APTET examination is now between June ... The information regarding the individual center and schedule would be available on the admit card or the hall ticket. The notification is available on the official website. All interested are advised to fill the online application form at the earliest.